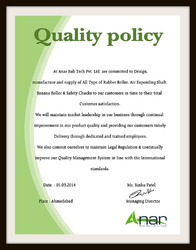 Established in the year 1978, Anar Rub Tech Private Limited is engaged in manufacturing, wholesaling and exporting of Rubber Rollers, Rubber Sleeves, Embossing Roller, Safety Chuck, Banana Rollers, Guide Roller. These products are extremely admired in the industry owing to their characteristics and low prices. Under the leadership of our mentor Mr. Rinku Patel, we are providing top quality of products. Owing to his commerce experience and deep commerce skill, we have achieved the success in this area in a proficient way. We are backed by an efficient and skilled team of experts. All the members of the teamwork cordially to fulfill the requirements of the clients. Our assiduous team works with a motive to provide best quality material to the clients. The research and development team conducts market surveys and implement strategies and introduce the technologies accordingly. In order to attain the maximum satisfaction of the clients, our after sales department takes utmost care of the needs and requirements of the clients. They also provide the clients with installation training. We are a team of 50 employees. Providing high-performance products is the one and only main objective of our company. Capitalizing our rich experience, innovative techniques, dexterous workforce and customer-centric approach, we have been successfully fulfilling this aim. We bring smiles to the faces of our valued clients through our quality products. We consider the satisfaction and happiness of our clients as the perfect reward for all our hard work. Anar Rubber is in the business of manufacturing, exporting and wholesaling of high quality and performance-based industrial rubber. 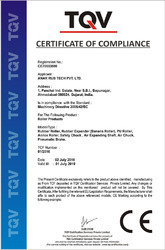 We are one reputed organizations, engaged in offering a qualitative range of Industrial Rubber Products. Our client-centric approach, company commitment, sound carriage and on-time delivery have made us the best choice of our clients. All the products are customized as per the details laid down by the customers. Beside, our clients can relief these from us at cheap costs.